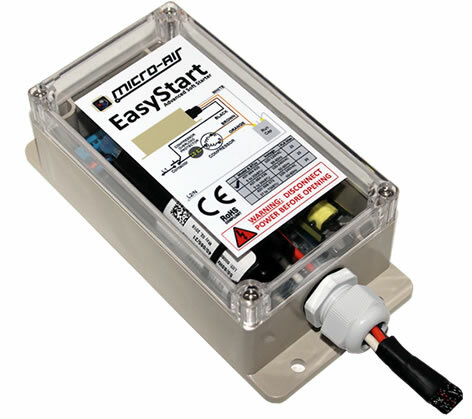 The EasyStart 368 Soft Starter For Residential Home Units By Micro-Air, Inc. This is our largest EasyStart and works with larger AC units (up to 72,000 BTUs). It is a necessity for the emergency power market to provide the electricity needed to heat or cool a home or office When weather or other power disaster knocks out power. It ensures that AC starts for anyone needing comfort, not the least of which include those with special medical needs. EasyStart™ is a one-of-a-kind, custom-developed soft starter for single-phase motors. It can support both 115 and 230VAC motors. It employs a 4-part start ramp sequence that is self-optimizing, resulting in the lowest possible start-up current. EasyStart™ can deliver up to 75% start current reduction as compared to a compressor's LRA (locked-rotor amperage). It also has numerous specialized fault checks not found in any other soft starter to provide further protection for your compressor. EasyStart™ is the perfect solution that allows an air conditioner or refrigeration compressor to operate on a smaller generator, inverter, or limited utility power. It can also be applied to air compressor and fluid pump motors. The EasyStart™ 368 is capable of supporting up to a 72,000 BTU (6 ton) compressor. It includes a fully-weatherproof (IP65), flameproof, plastic enclosure with an integrated mounting flange and a 32" (0.8m) wire harness. EasyStart™ 368 Soft Starter - WOW! AMAZING PRODUCT!! Thought it was too good to be true, but guess what? It works perfectly Installed on an 13.500BTU ac unit on a RV with 30 amp service, generator was only a 4k used to almost , or sometimes shut down generator when using AC on high. After installing and running thru the setup period 5 restarts. It works perfectly generator no longer struggles and battery backup will run AC off inverter and batteries for over 4 hours, with no charging!!! This is one really cool add-on for a rooftop AC unit on your RV Get ONE!!! !You won't be disappointed! 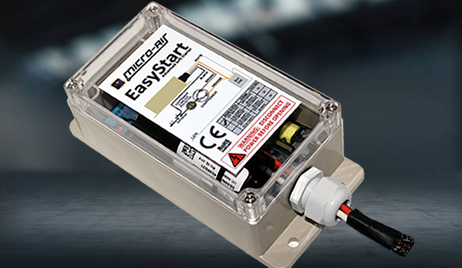 The EasyStart™ 368 Soft Starter - Worked Like a Charm! We have never been able to start our 5 ton home A/C with our 13 kw generator even after two A/C technicians and one electrician looked into our situation. Their recommendations varied from buying a larger generator to installing a hard start kit but we didn't want to spend big money on a larger generator and the hard start kit would only reduce the starting amps a little so it might not work. So when I found the EasyStart 368 online I was very optimistic that it would solve our problem. I installed it myself with a little help from customer support (thanks Matteo!) and our A/C unit now fires right up on generator power. We are very happy with the purchase! Thank you so much for replacing my air conditioner Soft Starter. I can’t praise your excellent company enough! What wonderful service and great attitude from your people – I was a fan of Micro-Air before now - even more so. Super pre-sale and after sales service.